Then, perhaps not the worst Mass ever, but certainly still terrible, is Bishop Tod Brown of Orange County California denying Holy Communion to a woman just because she decided to reverence the Lord. It happens around 20 seconds into the scene, after which the Bishop grabs are by the arms and compels her to stand up. 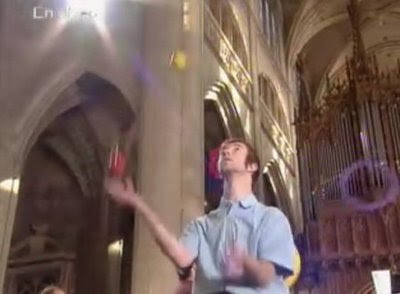 Of this scene, the woman later said: "I was sitting on the side of the Church, 3rd row, where Bishop Tod Brown distributed the Holy Eucharist, (in the video, I am the woman with short brown hair and glasses, wearing a black sweater and long white skirt sitting on the opposite side (from the camera) of the aisle in the center of the church) and upon approaching the Bishop to receive, I genuflected, out of reverence for the Sacred Species and remained on one knee to receive the Blessed Sacrament. Bishop Brown refused to give me Holy Communion. Bishop Brown said, "You need to stand up." I was in shock and didn't move or respond. He then reached out and took hold of my folded hands, attempting to physically pull me to a standing position, and said more sternly, "You need to stand." I looked up and whispered, quietly and respectfully, "Please, bishop", and he then grabbed my arm, and pulled me, as though to physically pull me up to a standing position (although obscured, you can see where he bends down and extends his right arm to grab mine) as he stated more loudly, "Get up".Still on one knee, I then asked very quietly and with genuine ignorance, "Why? "As he stood up straight he responded, very loudly and sternly, "Because THAT'S the way we receive communion. Now, GET UP, you're causing a scene.'" Here's another snippet from Bishop Tod Brown's Diocese of Orange County, including a homily given by a member of the teen band at a "Teen Mass." Why a return to Tradition is sorely needed. On January 5th, Cardinal Cláudio Hummes, Prefect of the Congregation for the Clergy, announced that he had sent to bishops, pastors, religious superiors, and seminary rectors all over the world a letter to ask that in every diocese "cenacles" of perpetual Eucharistic adoration be established, with the aim of "sanctifying" priests through prayer. 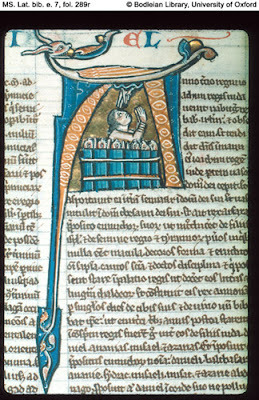 One aim of these cenacles that was mentioned specifically was atonement for sexual sins committed by members of the clergy. It is being reported that the letter is being accepted gladly in mnay dioceses throughout the world. I can't think of a better way to combat the damage done by the sexual problems in the Church than to turn to the Lord in Adoration. Way to go Cardinal Hummes. Cardinal José Saraiva Martins, Prefect of the Congregation for the Causes of Saints announced on January 9th that in February there will be a public presentation of the instruction Sanctorum Mater on the process for opening the causes for saints. The document – dated May 17, 2007, the Italian text of which was published in "Acta Apostolicae Sedis" issue no. 6, June 1, 2007, pp. 465-510 – translates into precise norms the guidelines that Benedict XVI gave to the congregation for the causes of saints in a message on April 27, 2006. The review will stress two points: caution and accuracy in looking into causes. I am very happy about the following comment from the instruction, which says that "the seriousness of the investigations" into the alleged miracles "be safeguarded, [...] the procedures for the examination of which have, over the last twenty years, produced problematic elements." This certainly is true. Many have commented on the haphazard way in which miracles are attested in the post-Vatican II Church, as is the case going on right now regarding Mother Teresa's supposed miracle. Greater guarantees have also been established concerning the "reputation of sanctity." It remains the case that, in order for the cause to proceed "there must emerge absolutely no element that goes against faith or good morals," so due emphasis must be given to "any findings that contradict the reputation of sanctity." This is excellent: the Church is going to adopt the traditional "devil's advocate" method of establishing sanctity by attempting to find fault with the persons presented for canonization. This ensures that whoever survives this process truly possesses sanctity. 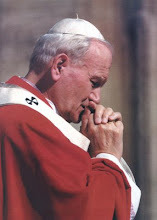 Probably the best part (listen up, all you folks who are already praying to John Paul II) is that the instruction warns that just because an investigation into a cause is already under way does not mean that canonization is imminent, and it cautions that the Servant of God "not be the object of undue devotion." This seems to suggest a remedy to the trend of exaggerated numbers of canonizations during the John Paul II pontificate, and we should recall that one of the very first decisions of Joseph Ratzinger, following his election as pope, was that of reserving only the canonizations for himself and of delegating beatifications to others, generally in the country of origin of the new blessed. "I believe that it is important first of all to consider the orientation that the liturgical celebration is always called upon to display: I refer to the centrality of the Lord, the Savior crucified and risen from the dead. This orientation must determine the interior disposition of the whole assembly, and in consequence, the exterior manner of celebrating as well. The placement of the cross on the altar, at the center of the assembly, has the capacity to communicate this fundamental aspect of liturgical theology. There can also be particular circumstances in which, because of the artistic conditions of the sacred place and its singular beauty and harmony, it would be preferable to celebrate at the ancient altar, which preserves the precise orientation of the liturgical celebration. This is exactly what happened in the Sistine Chapel. This practice is permitted by the liturgical norms, and is in harmony with the conciliar reform." "In the circumstances in which the celebration takes place in this manner, this is not so much a question of turning one's back to the faithful, but rather of orienting oneself toward the Lord, together with the faithful. From this point of view, instead of being closed the door is opened for the faithful, to lead them to the Lord. In the Eucharistic liturgy, the participants do not look at one another; they look to the One who is our East, the Savior." "In the liturgy of the ancient Church, after the homily the bishop or presider of the celebration, the main celebrant, said: 'Conversi ad Dominum'. Then he himself and everyone else stood up and faced the East. Everyone wanted to look toward Christ." "The references to the condition of "darkness" and "blindness" of the Jewish people will disappear, while the prayer for their conversion will remain. Because in the liturgy we are always praying for conversion, of ourselves in the first place and then of all Christians and non-Christians." Beyond all of this other good news, the coming of an explanatory letter defining how Summorum Pontificum is to be implemented was reaffirmed. 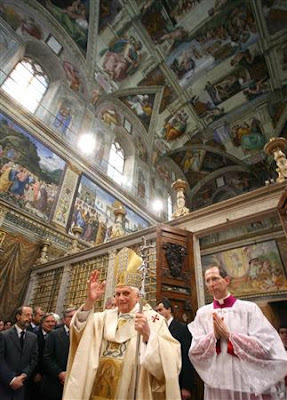 It looks like there is reason for hope in 2008; let' s keep praying for Benedict XVI and for the continued return to Tradition! One way progressive biblical scholars undermine the faith of the Church is by attacking the authenticity of the Sacred Scriptures themselves, and one of the most subtle but insidious ways of doing this is by questioning the historicity and authorship of certain books. For example, it is common in New Testament biblical scholarship to assert that the fourth Gospel was not written by John the beloved disciple around the year 90 AD, but was produced by a "Johannine community" (to use the phrase of biblical heresiarch and ex-priest John Dominic Crossan) influenced by the theology of John sometime around 150. This type of insidious "scholarship" has several effects. 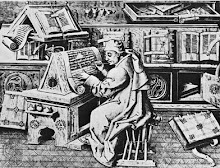 First, by purporting to be true scholarship (while often being nothing other than prejudice), it instills in the faithful the idea that the opinions of contemporary "scholars" (and there is hardly a more ambiguous term than "scholar") are more trustworthy than the perennial teaching of the Church. Second, it attempts to devalue the divine origin of the books without openly denying their inspiration. It has been believed from time immemorial that the Apostles or the Prophets were inspired by God to write the words of the Sacred Scriptures. Being told later that it was not actually that prophet or apostle, but a "community" who was "inspired" by his theology or ideals, greatly dums down the sense of divine origin of the books. Though the Church has never held a verbatim dictation theory of inspiration (as the Muslims hold of the Koran, for example), the further away we get from a notion of dictation the less sacred the books become. Thus we end up having less faith in them without actually denying them. A most pernicious manner of devaluing the sacred books is by attacking their historicity and placing their authorship much later in history than had previously been thought. Thus the Pentateuch is moved from 1200 BC to the post-exilic period, the Pslams were not written by David but by some Temple scribe of the Second Temple period, the Proverbs did not come from Solomon but from the Maccabean period, Matthew and John were composed in the 2nd century, etc. This has the two-fold effect of causing a loss of reverence for the Holy Scriptures, and more importantly, a disbelief in the teaching authority and traditions of the Church. Why? Because it comes down to us from Apostolic (and in the case of the Old Testament, pre-Christian) Tradition that certain books were written by certain people at certain times. For example, In Adv. Haer. 3.1.1, St. Irenaeus says: "Matthew also issued a written Gospel among the Hebrews in their own dialect while Peter and Paul were preaching at Rome and laying the foundations of the church." This would put the writing of Matthew around 65 AD. Remember, Irenaeus was only two generations removed from St. John. Long standing tradition affirmed Irenaeus' testimony that Matthew was indeed written by St Matthew the Apostle within a generation of Christ's Ascension. But, arrogantly throwing out 2,000 years of Tradition and Apostolic Testimony, progressive biblical scholar Francis W. Beare says of Matthew, "[T]here are clear indications that it is a product of the second or third Christian generation. The traditional name of Matthew is retained in modern discussion only for convenience" (The Gospel according to Matthew, p. 7). What are the so-called "clear indications?" Nothing but uncertain presuppositions based on the controversial and shaky Protestant Two Source Hypothesis (formulated by the liberal German Protestant Holtzmann). So all of the sudden, Church Tradition is made to look questionable while Protestant liberal biblical scholarship is more trustworthy. The entire deposit of Tradition and Church authority is sacrificed to the most current scholarship. Nevermind that St. Irenaeus, who knew Polycarp who knew John, said otherwise: we now know better than the Church Fathers! Fortunately, honest scholarship (the kind that takes testimony like that of St. Irenaeus at face value) has in recent years vindicated the traditional dating systems. Most commentaries today will even place John's Gospel around 95 AD and agree that it was written by John himself. But there is one book of the Scriptures that is continually plagued by liberal dating systems, even in otherwise conservative commentaries by companies like Ignatius Press. 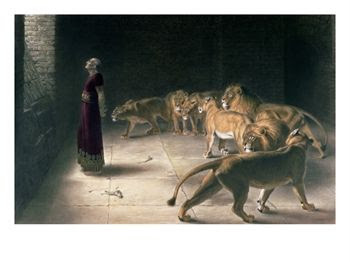 This is the Book of Daniel. Traditional dating places Daniel around the Persian period, around 500 BC, i.e., within living memory of the historical Daniel. The problem is that Daniel makes several stunningly accurate prophecies about the fall of Babylon, Persia, the rise of Alexander the Great and, most amazingly, the exact time of the advent of the Messiah. The prophecies are all way too accurate for progressives to deal with, and so they push the authorship of Daniel forward to the 2nd century BC, in the Maccabean time, and an era when almost all the prophecy in the book had been fulfilled. In effect, they demonstrate an anti-supernatural bias. If there is accurate prophecy, it must have occured after the fact (implicitly denying that accurate prophecy can happen otherwise). For example, the Ignatius Study Bible (an otherwise excellent resource), says in the footnote to Daniel on page 736 of the Second Edition: "[T]he visions of the second part are predominantly concerned with the later Greek Empire and it is unlikely that they were composed before that time. Their literary form, too, corresponds to the apocalyptic style of lierature common in the second century B.C." It seems that "literary form" is always the best argument these people can come up with. And when the book of Daniel was shewed him, wherein Daniel declared that one of the Greeks should destroy the empire of the Persians, he [Alexander] supposed that himself was the person intended; and as he was then glad, he dismissed the multitude for the present . . .
Alexander was shown the Book of Daniel by the High Priest in the year 332, well before the events prophesied in the book had come to pass. Even more amazing, Alexander was inspired by these words and encouraged in his war against the Persians! Unfortunately, this passage of Josephus is sometimes dismissed as a fabrication. But we ought to ask, why? At what point to our absurd attempts to deny the historicity of certain books get us into more logical difficulties than the original position we were setting out to deny? So, let's say that the passage in Josephus is untrue. Then Josephus either lied, or somebody interpolated a later text. If Josephus lied, then why do we, and all historians, still accept everything else he said without question? 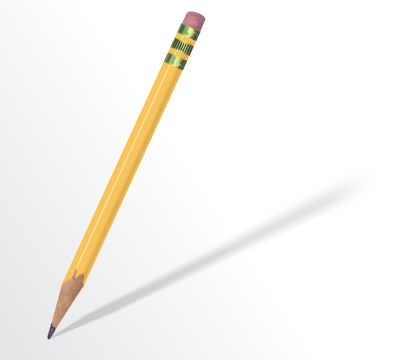 If there was an interpolator, then who, and where, and why? We are embroiled in much bigger problems if we deny the legitimacy of this passage from Josephus. This is an example of pure bias. When a record from antiquity comes up that contradicts some progressive position, it is simply written off as a fabrication. Here is a pretty good article on this same topic making the exact same point I have made (just to show you that I am not the only one who has wondered about this). Most Catholics are familiar with the glorious deeds of the Templar Knights of the Crusades, as well as their not so glorious demise at the hands of Philip the Fair of France in 1307. However, did you know that they have been reconstituted and are in existence today? I'm not talking about some weird Masonic group based on the Templar Knights, or the Templar Knights of the KKK of Rancho Cordova, California, but a bona fide Catholic restoration of the Templar Knights sanctioned by Rome. The Templar Knights were restored to the Church in 1979 under the name Christi Pauperum Militum Ordo, also known more simply as the Ordo Militiae Templi. It was founded in Siena and blessed by the Archbishop of that city (the current Cardinal Protector of the Militia is Édouard Gagnon). It was founded by Count Marcello Alberto Cristofani della Magione, who is also the current Grand Master. The new Templars are faithful to the perennial traditions of the Church, and their members make the following committments: recite the traditional Divine Office daily in Latin, to recite the (traditional) Rosary daily in Latin, to assist the traditional Mass as frequently as possible, to study assiduously and live out the spirituality and culture of Christian chivalry, and, in general to invest our energies in the restoration of Catholic tradition. It is open to lay persons as well as ordained and religious. After a two year novitiate, those found worthy to join the order travel to Castello della Magione near Siena where they are formally enrolled as a Knight (or a Dame, if you are a female). The order follows a modern adaptation of the original Templar rule written for the order by St. Bernard of Clairvaux. They observe the three evangelical counsels, as well as a fourth vow to publicly defend the faith. Their current members include hundreds of Knights in Obedience (lay persons), about 30 Knights with Solemn Profession, 10 national preceptories, many local priorates and scout groups. 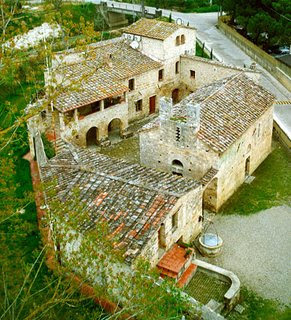 The headquarters of the order is in the Tuscan village of Poggibonsi, in an 11th century compoud that used to belong to the original Templars. 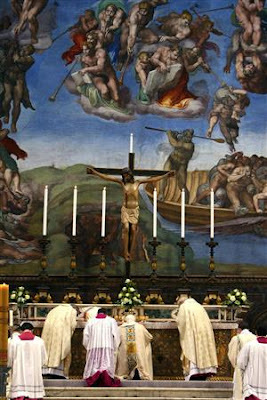 The Tridentine Mass is celebrated there daily. There are currently preceptories established in Italy, Australia, Austria, Canada, Germany, Switzerland, United Kingdom and Ireland, Poland, Romania, Hungary, Spain, United States of America, and Puerto Rico. The American contact for the order is Bro. 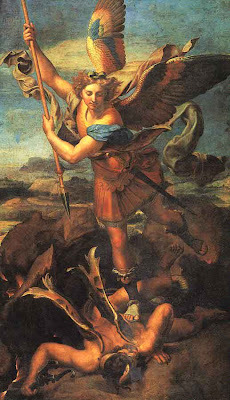 Charles Adams, CPMO (he can be reached at this address: usa@ordo-militiae-templi.org. Fellow Traditionalist Francisco Romero Carrasquillo, from the excellent blog Ite ad Thomam, is a postulant in this order, and it is from him that I got much of this information. Please pray for him and his wife as they prepare to enter this more excellent Catholic order. Check out the Templar's website here for more information. A priest was standing in the kitchen of his parish offices with another parishioner wondering what to do about a mouse problem. "What am I going to do?" the priest said. "We've tried mousetraps, we've tried poison and we've even tried getting a cat, and nothing seems to get rid of these mice!" The other parishioner thought for a moment and said, "Father, I think I know a way you can definitely get rid of these mice for good." "Well, tell me," said the priest. "Just baptize and Confirm them all," said the parishioner, "and that will solve your mouse problem." "Baptize and Confirm the mice?" "Yep. Baptize and Confirm them all," said the parishioner. The priest looked befuddled. "Baptize and Confirm mice? Why on earth would I do that? How could that possibly help?" "Well," said the man, "after you baptize and Confirm them, you'll never see them again!" 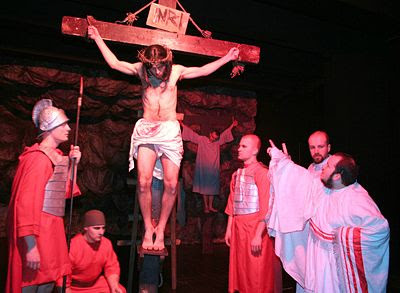 Ever since Il Giornale released the rumor that Pope Benedict will be altering the prayer for the conversion of the Jews in the traditional Good Friday liturgy, a wave of speculation and discontent has swept across the traditionalist blogosphere, and I'd like to put my two cents in on the issue. But before I discuss it, let's keep something in mind: this is merely a rumor at this time, and it is entirely possible that it may be on the same level with those who say that one day the Church will allow contraception, ordain women, approve Medjugorje. These are all things that will never happen, but many talk as if they are right around the corner. It is certainly possible that this could be the case. Then again, this may in fact be true. Many of us recall in June that the date of the motu proprio's release, the first words of it as well as parts of the explanatory letter were all leaked beforehand, and all this turned out to be accurate information. This rumor about the Good Friday prayers being changed may in fact be true. We are not like Moses, who would put a veil over his face to keep the Israelites from gazing at it while the radiance was fading away. But their minds were made dull, for to this day the same veil remains when the old covenant is read. It has not been removed, because only in Christ is it taken away. Even to this day when Moses is read, a veil covers their hearts. 1But whenever anyone turns to the Lord, the veil is taken away. Let us pray also for the Jews: that almighty God may remove the veil from their hearts; so that they too may acknowledge Jesus Christ our Lord. Let us pray. Let us kneel. Arise. Almighty and eternal God, who dost not exclude from thy mercy the Jews also: hear our prayers, which we offer for the blindness of that people; that acknowledging the light of thy Truth, which is Christ, they may be delivered from their darkness. Through the same Lord Jesus Christ, who lives and reigns with thee in the unity of the Holy Spirit, God, for ever and ever. Amen. All of these things, the blinding and veiling of the Jews as well as the prayer for their conversion, come straight from Scripture. As we have seen above, the section of the veiling of the Jewish mind comes from 2 Corinthians 3:13-16, and the prayer for their conversion is found throughout the New Testament, but is explicitly laid down in Romans 10:1: "Brothers, my heart's desire and prayer to God on their behalf is for salvation." So, if somebody says the Good Friday prayer is anti-Semitic, it is St. Paul whom they are accusing of anti-semitism, and the argument shifts to another plane. Second, I'm sorry that the Jews are offended that we pray for their conversion, but it is in fact a charitable and righteous thing to do. Do we want all people to be saved or don't we? Do we still believe that, as Acts 4:12 says of Christ, There is no salvation through anyone else, nor is there any other name under heaven given to the human race by which we are to be saved? Do we still take Christ's commandment seriously to preach the Gospel to all men? Of course people are going to be offended when we preach the truth to them! Christ promised as much to His very first disciples. But that is the very nature of the Gospel, to be a "stone of stumbling, and a rock of offence, even to them which stumble at the word" (1 Pet. 2:8). Of course a Jew or pagan or Muslim is going to be upset when you let them know that their religion does not show them the true way to the Father. The Jews were scandalized when Christ told this to them 2,000 years ago. Nobody likes to be told that they are wrong (and of course, there is more to evangelization than just telling people they are wrong), but sometimes it must be done. The Scripture says in proverbs 13:24 that He who spares his rod hates his son, and the same is true of evangelization: if we spare them the Word of Truth, then all our talk about love is an empty sham. If we don't tell them the Gospel, then we gate them, for the Gospel brings us to the One Who is Life. This scandalized the Jews of Jesus' day, and it makes sense that it would today. Third, if in fact the Pope does alter this prayer, I think it is very hypocritical. Nevermind that the prayer has already been altered several times since 1955, but even so, consider this: does it make sense to give us back the Traditional Latin Mass because you deplore a lack of continuity with Tradition and call the Novus Ordo is a "banal, on the spot production," and then go ahead and arbitrarily alter the prayers of the old Mass, giving us an "on the spot" Good Friday prayer? I thought the whole point of adhering to Tradition was the emphasis that the Church does not change with the spirit of the times? What could be more in keeping with the spirit of the times than altering the traditional Good Friday prayer to appease the worshippers at the altar of political correctness? Newsflash: We want the Jews to convert. We want Muslims to convert. We want Hindus to convert. Did we forget our mandate? It is this: that every single human creature on this planet becomes a Catholic. After all, they all are in heaven. Let's stop apologizing. Are we trying to win souls or make friends? Our "friends" won't think very highly of us when they are in hell because we didn't tell them the truth. So, to sum up my three thoughts here (1) Attacking the Good Friday prayers is actually attacking the Scriptures themselves and accusing them of being anti-Semitic, because the prayers come from the Scriptures (2) It is a charitable thing to want the Jews to convert, and (3) it is hypocritical to support Tradition and continuity only when it doesn't offend against the spirit of the times. "I have a theory that you can’t find any saints anymore because of psychotropic medication. I think that [in] the old days, the saints were hearing voices and they didn’t have any Thorazine to calm them down," Behar said on ABC's daily chatfest. "Now that we have all of this medication available to us, you can’t find a saint anymore." "That’s why Mother Teresa had issues. Let’s not forget, she didn’t really believe 100 percent like those saints who were hearing voices. She didn’t hear voices. So the church said ‘OK, she does good deeds. Let’s make her a saint.’ In the old days it used to be you heard voices. You can’t do that anymore." Behar immediately came under scrutiny for the comments, which were deemed insensitive to Catholics and stupid from a historical standpoint. Fr. Jonathon Morris, contacted to comment on the remarks, said, "Clearly she is no church historian. Saying 'she didn't believe 100 percent' is a simplistic and superficial reading of the news," said Morris. "Why would you spend 60 years in a slum in the name of Jesus out of love for God if you don’t believe in Jesus or God 100 percent?" Behar's spokespeople defended her, saying it was only a joke and protesting that Behar was a Catholic: "She said very clearly it was just a theory — she has lots of really funny theories that she kind of gives on a daily basis. She’s a Catholic, and she loves to talk about the Catholic Church. It’s one of her favorite subjects." This is the kind of stuff she says about "one of her favorite subjects?" I wonder what kind of drivel she says about something that is not one of her favorite subjects! Apparently we ought to just forget about the whole thing because Behar said it was "only a joke." Oh, so if we are joking then it is okay? Let me ask you a question: did the media forgive Michael Richards when he insulted African Americans in his famous 2007 nightclub tirade? Was Mel Gibson simply forgiven by the establishment when he made some drunken anti-semitic remarks? No. In both cases, the offending persons were ostracized and their careers called into jeaopardy. Now, at least Gibson and Richards made their comments in a semi-private settings (to a police man, and in a small night club). Neither Richards nor Gibson knew that the population at large would find out about their comments. But Behar makes these comments on national television, knowing she is being heard by millions of viewers! And she just wants to say, "I was only joking!" Did that cut it with Don Imus? He actually lost his job over his slip of the tongue. Protesting that it was meant in good humour did not help him. The sad thing is, people will simply forget about this. Anti-Catholicism is the only socially acceptable form of discrimination left in America, and this is another example of it. 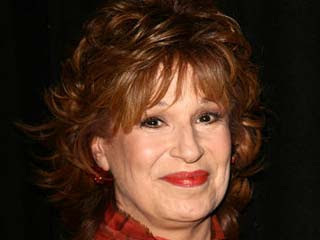 Please take our survey above regarding what should become of Joy Behar. I just came across an excellent article by Jude Huntz in an old issue of Homiletic and Pastoral Review (March, 1997) on the issue of receiving Communion in the hand. You can read the entire article here, and I have it linked on the sidebar under Excellent Catholic Articles, but below is a synopsis of what Jude Huntz listed as the 15 reasons why Communion in the hand out to be abolished, as Huntz says, to "contribute to the day when it will only be a reference in the history books." Here is an overview of the 15 reasons. We must remember that though Communion in the hand is the norm in the United States, this is only by way of indult, which Huntz reminds us is a grudging admission. Like many other concessions granted since Vatican II, Huntz also points out the Communion in the hand has been extended beyond the original intention envisioned by the indult. "The permission for Communion in the hand was hedged around with so many precautions, that some have concluded that even in countries where it would seem to be legal, actually, in the larger number of cases, it is still not allowed." It is Catholic doctrine that the true and entire Presence of Christ is present in either species, but also in each particle of the species. "Very great reverence, respect and care is to be taken of these fragments. Since this is the case, why would we multiply immensely the number of persons who are handling the Sacred Host, some of whom are clumsy, or cannot see well, or don't care, or don't know, etc." Communion in the tongue is not a form of clericalism; Huntz reminds us that even priests are not allowed to self-communicate, except as part of the consecration. 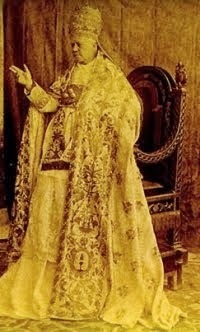 "When Pope St. Pius X, for example, was on his death bed in August of 1914, and Holy Communion was brought to him as Viaticum, he did not and was not allowed to receive in the hand: he received on the tongue according to the law and practice of the Catholic Church." We simply ought not to handle the Sacred Host unless we absolutley have to. The sacrament of Holy Communion consists of eating the Bread of Life. Those who receive it in the hand do not "take Communion in the hand." Each person self-communicates, effectively becoming their own extraordinary-minister. "[I]t is certainly eminently scriptural to refrain from touching something as a sign of reverence (and not only scriptural, but even universally human). 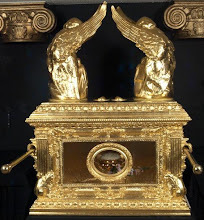 In the case of the Ark of the Covenant, it was absolutely forbidden to touch it, under pain of death. Even when it was "necessary" to do so, as it seemed to one unfortunate ark-bearer, it was still forbidden" (2 Sam. 6:6-7). The fact that the Apostles at the Last Supper (may have) self-communicated is no argument in favor of general self-communication because, "even if it were, though, we would point out that the apostles were themselves priests, or even, bishops." Every priest self-communicates at the Sacrifice of the Mass, the form of which was layed out by Christ at the Last Supper. Thus, the fact that the Apostles may have self-communicated is no more argument thna the fact that the priest self-communicates. Communion in the hand came out of two sources: (1) The Protestant Reformation, and there with an intentional aim of debying the Real Presence of Christ and treating the Host as ordinary bread, and (2) In modern times, "It is well known that Communion in the hand began spreading during the early nineteen-sixties, in Catholic circles in Holland. It began, then, as an aping of the Protestant practice, or at the very least as a "false archaeologism"...We can summarize that the practice of Communion in the hand came in modern times from heresy and disobedience. Is that what the Holy Spirit would inspire to bring about some desired liturgical change? One is permitted to think that perhaps a different spirit was at work." Though many quote a passage from St. Cyril of Jerusalem regarding making a "throne" in the hand to receive the sacrament, Huntz gives us several other quotes from the Fathers to demonstrate that Communion on the tongue was the norm at least as far back as Constantine and that Communion in the hand was only practiced during periods of intense persecution. One good quote is from St. Basil: "It is not necessary to show that it does not constitute a grave fault for a person to communicate with his own hand in a time of persecution when there is no priest or deacon" (Letter 93). The text implies that to receive in the hand under other circumstances, outside of persecution, would be a grave fault. Those who promote Communion in the hand are often the same who attack the Real Presence of Christ in the Sacrament and promote horizontalism. "Those in the mainstream liturgical establishment (and their followers) who promote Communion in the hand are the same persons who, for the most part, have a distaste in general for worship of the Lord in the Holy Eucharist, and perpetual adoration in particular." Eating with our hands is something so casual that it is difficult to translate this gesture into something sacred and profound. What do we eat with our hands? Finger foods, popcorn, chips, etc. In the natural order, we at least use silverware with more refined food (hence the golden or silver spoon of the Orthodox). But with the hand? That is how we eat popcorn. How can we take a gesture that is so trivial 98% of the time and make it reverent the other 2%? Holding something in our hand is a sign of possessing it, as when we buy a new car, we own it when we are handed the keys. It is therefore improper to hold God in the palm of our hand, for it implies that we "own" Him, and Scripture tells us quite the opposite: "I have carved you in the palm of My hand." How does Communion in the hand further ecumenism when of the twenty-one rites of the Church, we are the only ones who practice Communion in the hand as the norm? Most of the other rites are horrified by such a practice. Communion in the hand does more to harm ecumenism than to help it. "Is true Christian unity promoted by the present decadent state of our Eucharistic practice, of which a significant part is Communion in the hand?" "We must be rigorously honest with ourselves. Has this practice really strengthened and clarified our faith in the Real Presence? Has it resulted in greater prayerfulness, greater love, and a more abundant fraternal charity? Are we as a people more and more awe-struck at taking the Lord's Body into our hands? At least one fruit has manifestly not come from the introduction of this practice. And this is a feature also of the larger liturgical reform in general: unity has been injured. It seems to this writer, at least, that Communion in the hand must share part of the blame for the decline among Catholics in belief in the Real Presence." Even though JP II allowed Communion in the hand, he was no fan of it. Huntz recalls this anecdote: "The most remarkable example of this last is the time when the wife of the President of France, Madame Giscard d'Estaing approached the Pope for Holy Communion with hands outstretched. 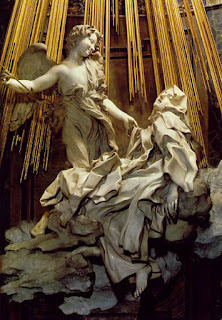 He ignored those hands and placed the Sacred Host into her (astonished) mouth." Then there is this wonderful story from the life of Mother Teresa: "Wherever I go in the whole world, the thing that makes me the saddest is watching people receive Communion in the hand" (Fr. George William Rutler, Good Friday, 1989, sermon at St. Agnes Church, New York City). In the end, the article maintains that "But this practice has been the occasion of great harm to the Church and to souls. It has expedited "indifference, outrages and sacrileges" towards Our Lord in the Blessed Sacrament. It is implicated in the manifest lessening of faith in the Real Presence which we see in our times." I encourage you to check out the entire article here, and I will have it linked permanently on the sidebar. Thanks to blogger Mr. S for digging up this article for me. Here is a great editorial piece from LifeSite by John Henry Westen on the kneeling posture for reception of Holy Communion. The article has to do with the statement of Auxiliary Bishop Athanasius Schneider of Karaganda, Kazakhstan (reported in L'Osservatore Romano) that reception of holy communion kneeling and on the tongue would be a greater aid to converting the non-believer than reception standing in the hand. The Bishop said, "If some nonbeliever arrived and observed such an act of adoration perhaps he, too, would 'fall down and worship God, declaring, God is really in your midst.'" Although in all likelihood most Catholics are oblivious to it, the decision to receive communion on the tongue, versus in the hand and the decision to receive communion standing rather than kneeling is a significant fault line in the culture war. Modernizers who relentlessly work to have the Catholic Church move away from so-called 'archaic' positions on sexuality, (forbidding contraception, pre-marital sexual activity, homosexuality etc.) also rail against 'archaic' piety in worship. The same people who are against liturgical excellence are against moral virtue. Westen goes on to connect the Reform of the Reform with the Pro-Life and pro-morality movements in general. What does it imply to connect the liturgical reforms coming to fruition under Benedict XVI with the Pro-Life movement and the Culture of Life? Think about it in the negative: if traditional liturgical form is connected with traditional morality and the Culture of Life, then what does that say about horizontalist, innovative, modernist liturgies? Wouldn't stand to reason that they are a manifestation of the Culture of Death? Whether or not the two are directly related, Westen is right in pointing out a connection: those parishes who insist on the most modernist liturgical innovations are the ones who stray the farthest from Catholic morality, supporting things like abortion, euthanasia and homosexuality. Remember, this is not just about the liturgy. It goes far beyond that. 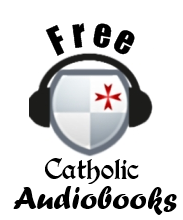 Save the Liturgy! Save the World! 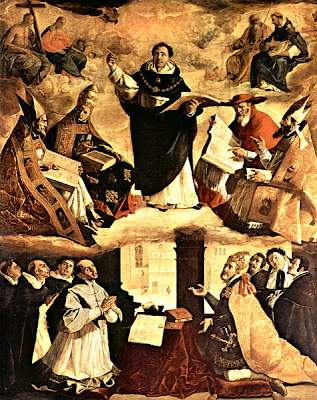 In part 1, we were looking at various examples of differences between the Traditional Latin Mass and Pope Paul VI's Novus Ordo Missae, noting especially the disconcerting similarities between the changes made by the Protestant Reformer Thomas Cranmer in England and those made by the post-Vatican II Consilium charged with implementing Sacrosanctum concilium (Decree on the Sacred Liturgy). 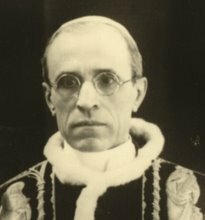 From Appendix III of John Wetherell's Lex Orandi Lex Credendi: An Examination of the Ethos of the Tridentine Mass and that of the Novus Ordo of Pope Paul VI. NOM: Abolished by Cranmer. Retained as an option in the Novus Ordo Missae, which also contains a Canon (Eucharistic Prayer II) which some Protestants consider acceptable. It makes no distinction between priest and people and does not include the word "Hostia" (victim). NOM: This was considerably modified by Cranmer, if indeed there was a consecration, and the Novus Ordo Missae has incorporated his most important modifications. TLM: The prayer Libera nos after the Pater noster. NOM: Luther and Cranmer abolished this prayer, owing to the invocation of saints at its conclusion. 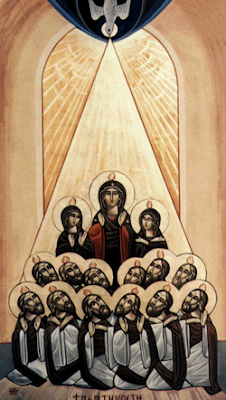 A modified version has been retained in the Novus Ordo Missae with no invocation of saints. NOM: A version of this prayer in the Sarum Missal was abolished by Cranmer. A modified version of the prayer has been retained in the Novus Ordo Missae but with the significant omission of the word "consecratio." TLM: Domine Jesu Christe, qui dixisti. NOM: This prayer did not occur in the Sarum rite but contains nothing to which a Protestant could object beyond the words "ne respicias peccata mea" in which the priest asks forgiveness for his personal sins. This is another prayer distinguishing between the priest and layman, and in the Novus Ordo Missae "peccata mea" has been changed to "peccata nostra" - "our sins." TLM: Domine Jesu Christi, Fili Dei and Perceptio Corporis tui. NOM: Modified versions of these prayers are included in the Novus Ordo Missae, one of which the priest says in his personal capacity before Communion. It is a matter for some satisfaction that such a prayer is included. Too much significance should not be attached to the use of realistic language regarding the Real Presence in these prayers. It was primarily sacrificial language which the Reformers wished to eliminate. They were able to reconcile the use of language apparently expressing belief in the Real Presence with the own theories. 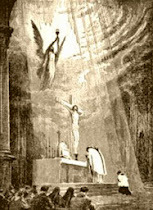 TLM: The Communion Rite (a) Communion given to the laity under one kind. NOM: (a) Communion given under both kinds in Cranmer's service. The occasions when this is done in the Novus Ordo Missae are multiplying. It is permitted at all Sunday Masses. TLM: (b) Traditional style altar breads. NOM: (b) the relevant rubric in Cranmer's 1549 rite states that altar breads should be: "unleavened, and round, as it was before, but without all manner of print, and something more larger and thicker than it was, so that it may be aptly divided in two pieces, at the least, or more by the discretion of the minister". Article 283 of the General Instruction reads: "Bread used for the Eucharist, even though unleavened and of the traditional shape, ought to be made in such a way that the priest, when celebrating with a congregation, can break it into pieces and distribute these to at least some of the faithful". TLM: (c) The Host is placed on the tongue of the kneeling communicant by a priest. NOM: (c) Cranmer retained all three traditional practices in his 1549 rite, but in the 1552 rite Communion was given in the hand to signify that the bread was ordinary bread and the priest did not differ in essence from a layman. Communion is now given in the hand in almost every Western country but the Novus Ordo Missae has out-Cranmered Cranmer [!] by allowing communicants to stand and receive from a lay minister. TLM: Quod ore sumpsimus and Corpus tuum. NOM: These prayers so not refer to sacrifice, but their explicit references to the Real Presence would not commend them to Protestants although Luther felt able to retain them owing to his theory of consubstantiation. The first was not in the Sarum rite, the second was, and Cranmer suppressed it. Both have been suppressed in the Novus Ordo Missae. NOM: The Placeat tibi was a bête noire for Protestants. This prayer alone would have rendered the Novus Ordo Missae unacceptable to them had it been retained. Following the example of Luther, Cranmer, and other Reformers, the Consilium suppressed this prayer. NOM: There is nothing in the Last Gospel incompatible with Protestantism but its retention in the Novus Ordo Missae would have clashed with the pattern of Protestant Communion services which conclude with a blessing. The Consilium suppressed it. All due credit for the above goes, as I mentioned, to John Wetherell and is taken from his book Lex Orandi Lex Credendi. It is a useful exercise to go back through this lengthy (but far from complete!) list of changes made to the Mass and ask oneself: Did the good of the Church genuinely [!] and certainly [!] require [!] this innovation? 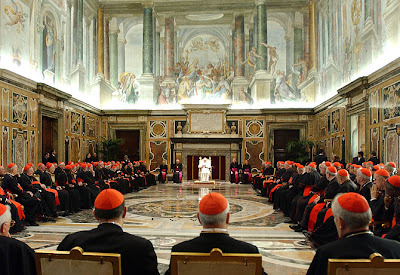 Vatican II stipulated after all that "there must be no innovations unless the good of the Church genuinely and certainly requires them" (Sacrosanctum concilium, 23). 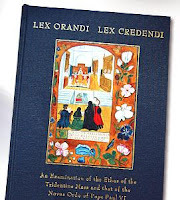 I finished reading yesterday a Christmas present from my father-in-law entitled Lex Orandi Lex Credendi: An Examination of the Ethos of the Tridentine Mass and that of the Novus Ordo of Pope Paul VI by John Wetherell. The book, as you can see, is physically beautiful; it is published by the newly established Saint Joan Press, which describes itself as "a traditional Catholic publishing house producing high quality hardback books at affordable prices." If this book is any indications, there are good things to come. I found particularly interesting the third appendix, which catalogues some of the major differences between the Traditional Latin Mass [TLM] and Novus Ordo Missae [NOM] while showing at the same time the disconcerting similarities between the latter and Thomas Cranmer's 1549 communion service. Below are abour half of the comparisons made by the author. NOM: Cranmer entitled his 1549 service: "The Supper of the Lord and the Holy Communion commonly called the Mass". The Novus Ordo Missae was entitled "The Lord's Supper or Mass" in the original Article 7. The term "Lord's Supper" is still included in the revised Article 7. NOM: Cranmer's Lord's Supper celebrated in the vernacular. The Novus Ordo Missae celebrated in the vernacular. TLM: Much of the Mass said inaudibly. NOM: Cranmer's service one of public praise and thanksgiving and therefore said audibly, with the possible exception of the Offertory Prayers in a sung service. Novus Ordo Missae said audibly throughout. TLM: Celebrated on an eastward-facing altar. NOM: Cranmer's service celebrated on a table facing the people. Novus Ordo Missae celebrated on what is clearly intended to be a table facing the people. TLM: The Psalm Judica me, unacceptable to Protestants in virtue of its reference to the "altar of God". NOM: Suppressed by Cranmer. Suppressed in the Novus Ordo Missae. TLM: Double Confiteor distinguishes between priest and people, which is unacceptable to Protestants, as is the invocation of the saints. 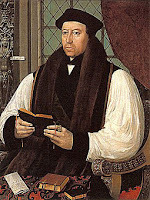 NOM: Cranmer changed and moved the position of the Confiteor. 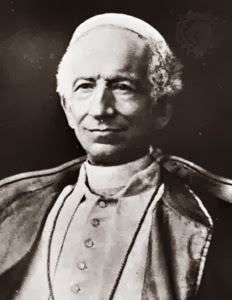 The double Confiteor has been suppressed in the Novus Ordo Missae, thus blurring the distinction between priest and people. 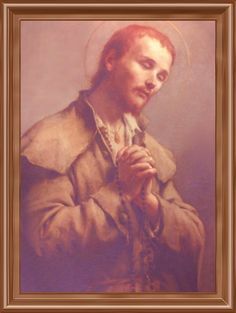 A truncated Confiteor invoking the angels and saints is included as an option but other penitential rites containing no such invocation and thus completely acceptable to Protestants are provided. TLM: The prayer Aufer a nobis evokes Old Testament sacrifice with its reference to the Holy of Holies which the High Priest entered to offer the blood of the sacrificial victim. NOM: Suppressed in the Novus Ordo Missae. TLM: The prayer Oramus te, Domine refers to the relics in the altar stone. NOM: The use of an altar stone is no longer obligatory for movable altars or when Mass is celebrated outside a consecrated building. An altar stone is only "commended" for permanent altars (Institutio Generalis 265-6). The prayer has been suppressed in the Novus Ordo Missae. TLM: Introit, Kyrie, Gloria, Collect, Epistle, Gospel, Creed. NOM: Retained by Cranmer in 1549. Retained in Novus Ordo Missae. TLM: The Offertory Prayers: Suscipe, sancta Pater Deus, qui humanae Offerimus tibi, Domine In Spiritu humilitatis Veni, sanctificator omnipotens Suscipe, sancta Trinitas. NOM: Comparable prayers in the Sarum rite suppressed by Cranmer. All these prayers suppressed in the Novus Ordo Missae. NOM: Suppressed by Cranmer and suppressed by the Consilium in the draft for the Missa Normativa. Restored as a result of pressure at the 1967 Synod in Rome. TLM: Secret Prayers (Proper of the Mass). NOM: These prayers often contain specifically sacrificial terminology. They were abolished by Cranmer but have been retained in the Novus Ordo Missae though frequently emasculated in the I.C.E.L. translations. As these prayers do not form part of the Ordinary they do not provide an obstacle to achieving an ecumenical Ordinary. TLM: Sursum corda dialogue, Preface, Sanctus. NOM: Retained by Cranmer. Retained in Novus Ordo Missae.